As noted in System Requirements, the Windows version of SIMION is tested, confirmed to run quite well, and is officially supported by SIS on Intel-based Mac OS X via these three methods: CrossOver Mac, VMWare Fusion, and Parallels Desktop for Mac. In Summary, there is not a native binary build of SIMION 7.0/8.0/8.1 for Mac OS. Nevertheless, you can achieve quite good results running SIMION 8.1/8.0 (maybe SIMION 7 too) on an Intel-based Mac if you use a Windows compatibility layer (CrossOver Mac) or a virtualization layer (VMWare Fusion or Parallels Desktop for Mac). (Options for very old PowerPC-based Macs are more limited.) The main possible methods of running SIMION on a Mac are listed below, listed roughly in decreasing order of preference. Option #1: Windows Compatibility Layer: such as CrossOver/Darwine on Intel Macs - These include the commercial CrossOver Mac, which is based on the open Darwine (Wine) project. CrossOver is generally recommended over Darwine since there are reports (as of early 2007) that it works smoother in general, it is quite inexpensive, and we currently only have reports of running CrossOver. Crossover/Darwine is currently only expected to possibly work on Intel-based Macs (not very old PowerPC-based Macs); this is made possible by the Apple switch to Intel Processors (wikipedia). CrossOver runs SIMION at native speeds within Mac OS via Wine technology, similar to how a number of users have already been successfully running SIMION under Linux via Wine. (Note: please update to SIMION 8.1.1.23 or later to improve Fly’m speed though.) CrossOver Mac was officially tested, confirmed to work quite well, and is formally supported by SIS for use with SIMION 8.0. See screenshot [*1] below of SIMION 8.0.x under CrossOver Mac. Option #2: Virtualization Layer: such as VMWare Fusion or Parallels Desktop for Mac on Intel-based Macs. VMWare Fusion and Parallels were both officially tested, confirmed to work quite well, and are formally supported by SIS for use with SIMION 8.0. There also have been reports for SIMION 7.0. These run at native speeds. Microsoft Virtual PC for Mac and related virtualization products have not been tested but might work too. Option #3: Emulation software - such as Microsoft Virtual PC for Mac might allow SIMION to be run on an older PowerPC-based Mac, but it would not be expected to run at native speeds. There have been a few unconfirmed reports of using Microsoft Virtual PC, but we are not aware to what extent this works. We believe there was some annoyance with the mouse in the Modify screen in SIMION 7 (if there are issues, SIMION 8 may very well run better there). CPU emulators generally cause a good performance decrease, and this would not be an ideal setup for a computationally intensive application like SIMION; however, it could be sufficient for some things. Option #4: Native compilation of SIMION to Mac OS binaries is currently not provided, nor is it much a development priority because CrossOver Mac on Intel Macs is expected to be a very suitable option, so time/effort is likely better spent on other things. In theory, it would be possible to compile a non-GUI version of SIMION 8 (with only the command-line interface) under GCC without much difficulty, and this is an option in the future. In theory, it would also be possible to compile a GUI version of SIMION 8 as well since the SIMION 8 GUI is migrating to a cross-platform framework, but it would likely require some porting effort in practice (it still has Win32 code), and that effort if at all may well instead go elsewhere. Any further reports or tips on running SIMION under Mac OS are appreciated! [*1] Thanks to Ryan Ringle at TRIUMF for initial reports of running SIMION 8.0.x under CrossOver Mac (2007-02). [*3] Thanks to Elizabeth MacDonald for initial Parallels report. Related discussion: SIMION Discussion Group Post 1810. SIMION 8.0.x under CrossOver Mac. From Ryan Ringle/TRIUMF. 2007-02. 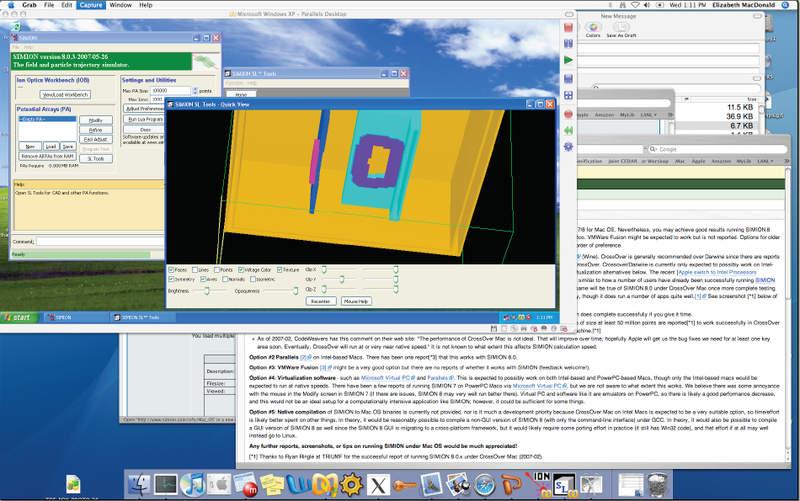 SIMION 8.0.3 and SL Tools under Intel MacBookPro (combined screenshots), 2007-08. From Elizabeth MacDonald. Running the Windows version of SIMION 8.1 (and 8.0) on Intel-based Mac OS X is formally supported via the following three methods. (Note: very old PowerPC-based OS 9 Macs will generally not work well or at all.) These methods have been tested by SIS and work quite well. Other less-formally supported methods may work as well, particularly virtualization software like VMWare/Parallels. See also http://www.simion.com/info/Mac_OS . Windows Licensing: Using CrossOver does not require a Windows license. Using virtualization software like Parallels and VMWare VMWare does require you have and install a licensed copy of Windows into the virtual machine (Windows is purchased separately). The CrossOver method can be more cost effective. Performance: Both CrossOver and virtualization (VMWare and Parallels) run largely at native speeds. For optimal Fly’m performance under CrossOver, please update to SIMION 8.1.1.23 or above though. Memory usage: 32-bit SIMION (8.1 and 8.0) under both Parallels, VMWare, and CrossOver has a memory limit of roughly 1.2 GB, of 130 million points, or higher per PA (when the “–reserved-memory” option is used). This may depend on guest OS and virtual machine memory allocation settings (which were not fully explored during testing). 64-bit SIMION 8.1 running in a 64-bit virtual machine (not 32-bit CrossOver), such as 64-bit Windows or even Wine64 on a 64-bit Linux should not have this limitation. As of this writing, there is not a 64-bit (Wine64) version of CrossOver. Excel (conditionally supported): Controlling Excel from SIMION is only supported via virtualization (i.e. Parallels/VMWare not CrossOver) and only if Excel is a Windows version installed on the virtual machine. As of 8.1.0.20, examples can alternately use gnuplot. Old version notes: SIMION 8.0.5 may freeze when using CrossOver versions prior to 7.10. Either upgrade CrossOver to >= 7.10 or downgrade SIMION to <= 8.0.4. Summary: SIMION 8.0 and 8.1 run well on all the above options. If you want integration with (Windows) Excel you should use virtualization (VMWare or Parallels), but if you want better integration with OS X applications you might want to instead use CrossOver since SIMION will then run more like an OS X application. SIMION 7.0 works ok on all the above but seemed to run most smoothly under Parallels (SIMION 7.0 does some tricky things with the mouse that cause some non-critical mouse behavior issues under CrossOver and VMWare). Overview: As of December 2007, SIS is formally supporting running the Windows version of SIMION 8.0/8.1 on Intel-based Mac OS X via a third-party application called CodeWeavers CrossOver Mac. This means that this combination generally runs quite well, and has been tested by SIS. You could run into a few minor issues as discussed below, but SIS can help with some setup questions and intends to patch SIMION if any incompatibilities are discovered. Version compatibility: SIS testing was performed on the following configurations. Newer versions, as well as older versions, likely work as well (or better), and other users have already successfully tried other versions. CrossOver Max 12.2.1 on Mac OS X 10.6.8 with SIMION 8.1.1.32. CrossOver Mac 11.2.2 on Mac OS X 10.5.8 with SIMION 8.1.1.23. CrossOver Mac 10.1 on Mac OS X 10.5.8 with SIMION 8.1.0/8.0.6. CrossOver Mac 6.2.0 on Mac OS X 10.4 with SIMION 8.0.4/8.0.3. Performance: Fly’m speed under CrossOver Mac has much improved as of SIMION 8.1.1.23, so it’s recommended to update SIMION if you have an earlier version. In previous SIMION versions, Fly’ms under CrossOver could be 2x slower or much worse. Fly’m speed under CrossOver is now about the same as under virtualization (e.g. Parallels Desktop for Mac or VMWare Fusion). Other operations such as refining are about equal in speed between CrossOver and Parallels as well. Right mouse button: SIMION uses the right mouse button for operations such as zooming and rotating, but the default mouse on some Macs lack a right mouse button. The OS X “System Preferences > Mouse” settings also have options that control whether the “Secondary Button” is enabled (it should be enabled). If you have a single button mouse, there are key combinations to work around this (e.g. press the Command key which mouse clicking), but you might just replace the mouse with a two-button USB mouse (a USB mouse taken from a PC will work). Please upgrade SIMION to 8.1.1.32 or 8.1.2.2 if the mouse scroll wheel does not respond on the Modify 3D view. On the Modify 3D window, dragging the left mouse button creates a selection rectangle; although this rectangle appears invisible under CrossOver, it is actually there. Clipboard: Printing to Clipboard doesn’t seem to do anything. However, you can print to a file (PS or EMF) and load in another application. A screenshot can be taken using %-Shift-3 (entire screen), %-Shift-4 (rectangle), or %-Shift-4 then spacebar (window), which is saved as a file on the desktop (see “Shortcuts for taking pictures of the screen” in the CrossOver help). Excel (not supported): Communication between SIMION and Excel via the COM/OLE interface does not seem supported on the Mac. A few of the Lua user programs in the SIMION examples interface with Excel over COM for real-time data reporting and charting. On the other hand, as of SIMION 8.1.1.16, most of these examples can alternately utilize gnuplot instead of Excel, and gnuplot does work on OS X (see SIMION Example: gnuplot and SIMION Example: plot). You can use either a native Mac or a Windows version of gnuplot. The native Mac version of Excel 2004 does not support COM either. Though you can install the Windows version of Excel (which does support COM) on CrossOver, CrossOver COM support appears very limited, though it might be possible by installing “DCOM95/DCOM98”. We have not yet had success doing this (though have not tested it recently). And you may be interested in outputting your data to some other program. It is possible of course to write a .csv file from SIMION and then load that into Excel (rather than rely on real-time communication). Supplemental Help Documentation (SIMION 8.1): This mostly works but may have a few issues. Hyperlinks to SIMION examples or external web pages have been known not to work in the past. It seems to work in SIMION 8.1.1.32 on CrossOver 12.2.1. The “Doc” button on the View screen for opening the README web page has been known not to work in the past. It seems to work in SIMION 8.1.1.32 on CrossOver 12.2.1. If that fails, open the file separately it in a web browser. os.execute("start notepad results.csv") in SIMION Example: geometry_optimize does nothing (returns 9009). However, os.execute("notepad results.csv") works and does not block. Works in CrossOver 11.2.2 on SIMION 8.1.1.18. Installation Stall: When installing SIMION, the CrossOver Software Installer may appear to stall for a few minutes (displaying message “Installing Unsupported Software”) before the SIMION installer window appears. This is OK. No longer occurs in SIMION 8.1.0/CrossOver 10.1 or SIMION 8.1.1.18/CrossOver 11.2.2. The mouse scroll button didn’t work in text boxes. This seems ok in SIMION 8.1.1.18/CrossOver 11.2.2 though. Please update to 8.1.1.32 or 8.1.2.2 to fix mouse scroll wheel not responding on the Modify 3D view. OPENGL (Modify 3D view): works (though opens in a separate window). Opening Notepad (e.g. “User Program…” button in View or os.execute “notepad” in Lua: works. Opening web browser: “Check for Updates” works. “Docs” button has issues (see above). 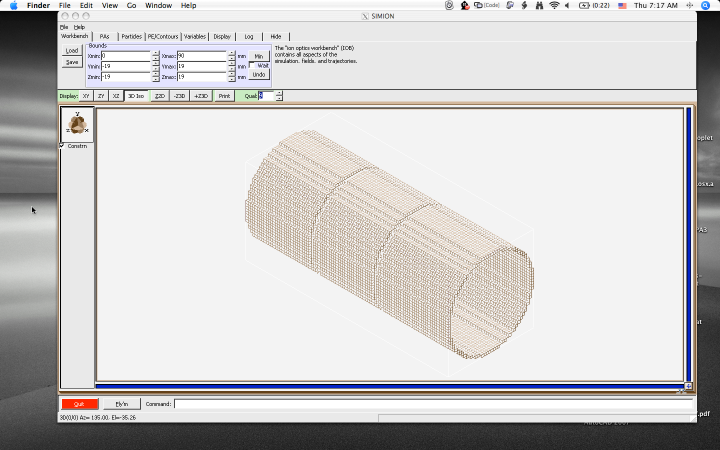 Copy/Paste from Log Window: works. SIMION 7.0 Notes: SIMION 7.0 has also been known to work under CrossOver but there are a couple issues. There are some mouse behavior problems where the mouse moves to the center of the screen whenever the mouse is clicked. Relying more on the keyboard can work around this. Resizing the SIMION 7.0 window can sometimes cause stability problems, though pressing the Window close button in the upper left title bar and then selecting No can reset it. Overview: As of December 2007, SIS is formally supporting running the Windows version of SIMION 8.0.x on Intel-based Mac OS X via a third-party application called Parallels Desktop for Mac ( http://www.parallels.com/en/products/desktop/ ). This means that this combination generally runs quite well, and has been tested by SIS. You could run into a few minor issues as discussed below, but SIS can help with some setup questions and intends to patch SIMION if any significant incompatibilities are discovered. Version compatibility: SIS testing was performed on the following configuration. Newer versions, as well as older versions, likely work as well (or better), and other users have already successfully tried other versions. Parallels Desktop 3.0 for Mac on Intel-based Mac OS X 10.4. running Windows 2000. SIMION 8.0.3/8.0.4. Performance: Refining and flying run at roughly native speeds. Memory: PA size of 125M points works. Using –reserved-memory only allows minor increases (e.g. 150M points). Right mouse button: SIMION uses the right mouse button for operations such as zooming and rotating, but the default mouse on many Macs lacks a right mouse button. It is recommended you replace the mouse with a two-button USB mouse (a USB mouse taken from a PC will work). OpenGL: Open GL (3D viewing in Modify) works well except resizing window (and mouse scroll bar) may cause OpenGL window to become blank. A workaround is to close and reopen the window. Parallels Coherence display mode: works. CPU SSE2 Warning: SIMION reports that SSE2 is not detected (even though the CPU does have SSE2) and reverts to non-sse2 mode. This can be ignored (minor performance impact). Excel: Controlling Excel in Parallels works providing a Windows-version of Excel is installed on the virtual machine (tested Excel 2003/Win2K). The native Mac version of Excel does not provide a COM interface. As of 8.1.0.20, examples can alternately use gnuplot. SIMION 7.0 Notes: SIMION 7.0 also works well under Parallels. Overview: As of January 2008, SIS is formally supporting running the Windows version of SIMION 8.0.x on Intel-based Mac OS X via a third-party application called VMWare Fusion for Mac ( http://www.vmware.com/products/fusion/ ). This means that this combination generally runs quite well, and has been tested by SIS. You could run into a few minor issues as discussed below, but SIS can help with some setup questions and intends to patch SIMION if any significant incompatibilities are discovered. VMWare Fusion 1.1 on Intel-based Mac OS X 10.4 running Windows XP. SIMION 8.0.4. Memory: PA size of 180M points works (when using --reserved-memory=1.8G command-line option). Mouse scrolling: The scroll bars in the Modify and View screens behave a bit oddly (but are usable) since VMWare is not locking the mouse cursor position on the scrollbar when the mouse button is pressed down. Printing: Works provided a printer is setup in VMWare. Copy/Paste: VMWare seems to only copy/paste text (not images) between the guest and host OS, but there are various ways to use SIMION’s printing or Windows screencapture (e.g. F13) to write an image file in windows and then drag and drop the file onto the OS X Desktop. OpenGL: OpenGL mostly works except some crashes were noticed when switching in/out of OpenGL under VMWare’s “Unity” mode. The workaround is to use the Window or Full Screen modes or avoid OpenGL in Unity mode. VMWare Unity display mode: generally works, but see OPENGL comments above. Excel: Controlling Excel in VMWare works providing a Windows-version of Excel is installed on the virtual machine (tested Excel 2003/Win2K). The native Mac version of Excel does not provide a COM interface. As of 8.1.0.20, examples can alternately use gnuplot. SIMION 7.0 works ok under VMWare. Some of the mouse behavior is awkward (e.g. selecting a rectangle in View/Modify screens). 8.1.1.32/8.1.2.2: Fix mouse scroll wheel not responding on Modify 3D view. 8.1.1.23: Fly’m speed (GUI and non-GUI) improved by a couple of times under CrossOver Mac. Fly’m speed is close to native now under CrossOver. Tested on CrossOver Mac 11.2.2. 8.1.1.18: GUI mode Fly’m performance under CrossOver Mac (OS X) roughly doubled. 8.1.1.18: Fixed warning about “FontEnumerator::IsValidFaceName(font.GetFaceName())” upon loading Log window (or View screen). Confirmed in CrossOver Mac 11.2.2 / SIMION <= 8.1.1.17. Prior to this fix, a workaround is to click “No” when prompted “Do you want to stop the program?”. 8.1.1.18: Doc button may be more reliable now. 8.0.6: GUI/OpenGL/Wine: Fixed OpenGL 3D Modify window in Linux/Wine. Broken in 8.0.6-TEST6. 8.0.6: GUI/Wine: Fixed Check for Updates button not displaying on CrossOver Mac OSX (Vista bottle). Broken in 8.0.6-TEST16. 8.0.6: GUI/Keyboard/Wine: Fixed keyboard shortcuts in Linux/Wine (focus problem). Broken in 8.0.6-TEST7.